Rome, a place of valiant and fierce gladiators during the ancient time. The famed city during the reign of Julius Caesar, a popular leader of the Roman Republic who significantly transformed what became known as the Roman Empire. It is the capital and largest city of Italy and of the Lazio region, is said to be the city of ruins that never was. For me, whatever the Eternal City is offering the modern world, it is a superb sightseeing opportunities for everyone. No! 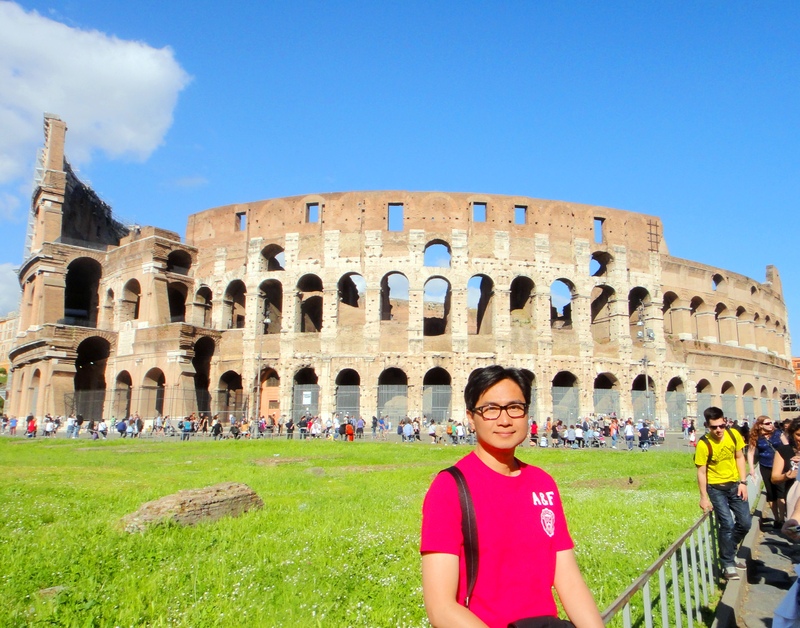 I guess I’m wrong with that… experiencing Rome extends far beyond sightseeing. Rich in history that spans more than 2,500 years of significant influence in the world. Its architecture, sculpture, arts, churches, museums, culture, food and ancient ruins that became iconic to the world and made Rome one of the most visited places. Though the tourist crowd is truly overwhelming, it is worth every minute strolling the cobbled stones of this historic place. Appreciate the unique umbrella pine trees of Rome, scattered and planted beautifully within the city especially in Piazza Venezia. 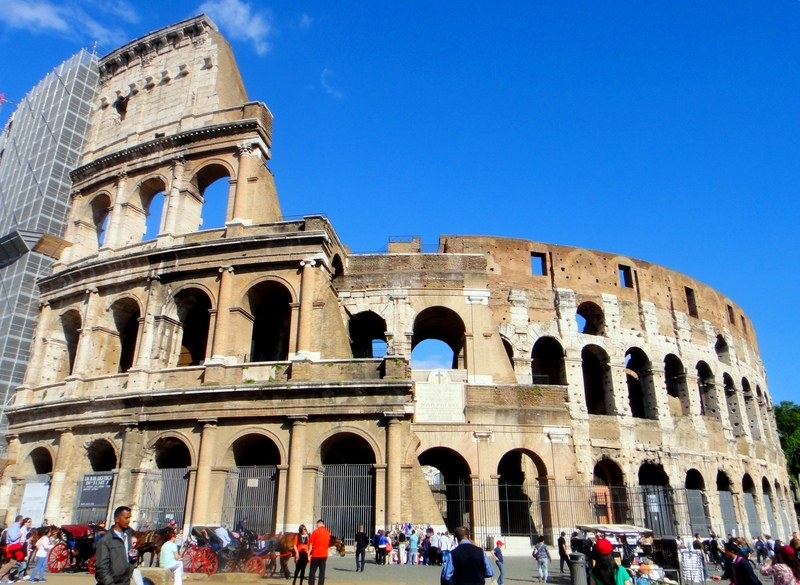 Yes, Rome is a walkable city, and by doing so you’ll get the chance to follow the footsteps of the mighty warriors, gladiators and popular leaders who rule and roam this marvelous city during the ancient time. I really don’t know how to describe Rome. There is something about Rome that are much better felt than described. The Eternal City is like a large open-air museum with dozens of must see ancient ruins at the center of this fascinating place, where the ancient world blends well with the modern life. 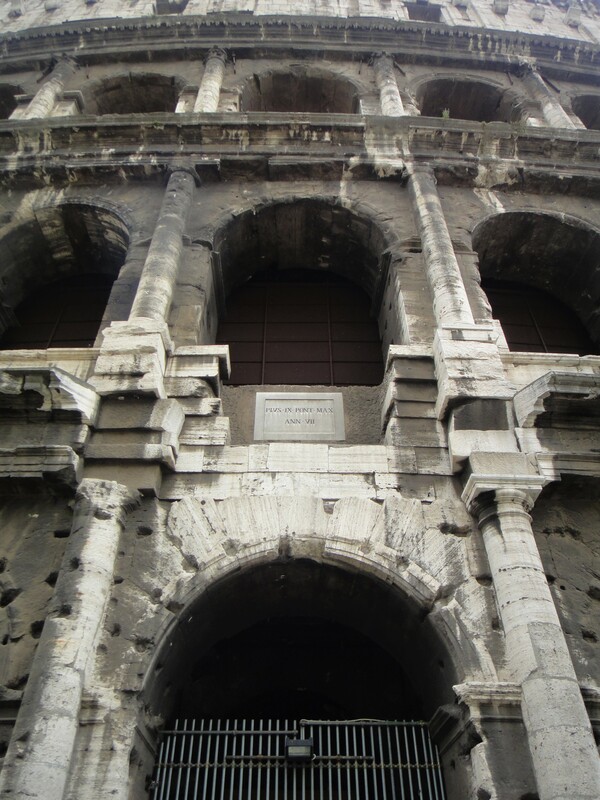 COLOSSEUM also known as the Flavian Amphitheatre, is an oval amphitheatre in the center of the city. 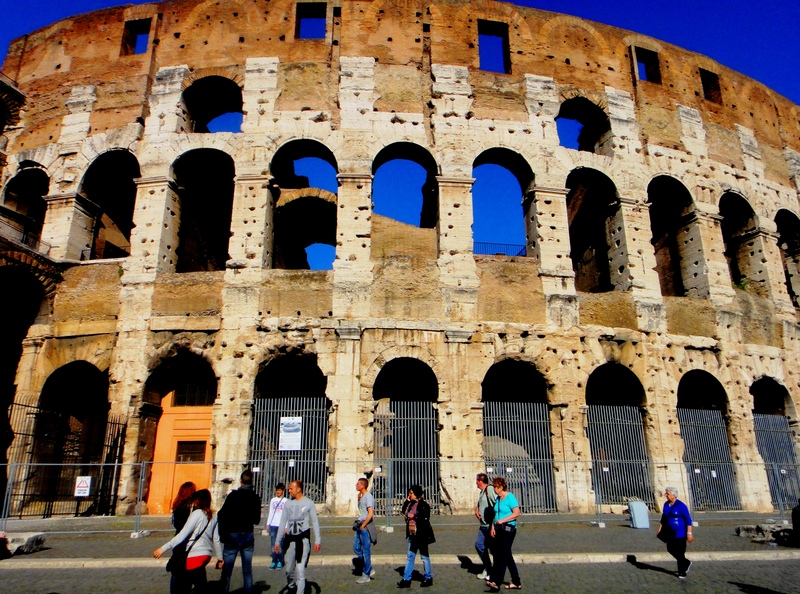 Considered as the main symbol of Rome is an iconic ancient Roman gladiator arena. It is said that Rome’s most popular monument was built for three reasons. As a gift to the Roman Citizens from the Flavian Dynasty to increase their popularity, to stage various entertainment and to showcase Roman engineering techniques to the world. I have this weird routine when I travel. Every time I’m near an iconic structure with tremendous stories about it, I usually sit somewhere near it and close my eyes trying to have my very own time machine imagining the place way back then. I imagine the gory battles between combinations of gladiators, slaves and prisoners. The roaring of wild animal fights. The blaring sound of people inside the arena watching an intense blood-soaked barbaric combat in this massive breathtaking structure. Oh, just the thought of it truly makes me shiver. It was horrendous, just like those films that featured such scene. There goes my imagination hahaha! Roman Forum is a collection of ruins and historic buildings which used to be a bustling market place, where you can explore the iconic pillars and churches nestled in the old cobbled streets. It is said to be the original downtown of Rome and considered as the social, political and commercial hub of the Roman Empire. Thinking how busy this place during those times, and perhaps the most modern metropolis of the archaic Rome. Altare della Patria also known as the Monumento Nazionale a Vittorio Emanuele II, is a monument built in honor of Victor Emmanuele, the first king of the unified Italy. It is within Piassa Venezia. Trevi Fountain or Fontana di Trevi, is Italy’s largest and most famous Baroque fountain, standing 85 feet high and 65 feet across. Baroque art, a popular European art form between 1600 and 1750, is characterized by highly ornate and decorative art and architecture. The fountain can be found in Rome’s Piazza di Trevi in the Quirinale district, easily reach by bus or metro. An overwhelming jam-packed area of tourist will welcome you in this attraction. The fountain itself is stunningly beautiful in every aspect and angle. Truly a work of art. You’ll notice people follow the tradition of throwing coins over their shoulder. According to legend, that a coin thrown into the fountain will ensure a return to Rome. With that said… I have my share of coins thrown into the fountain with a wish hahaha! What many don’t know is that the coins are collected every night and given into an Italian charity called “Caritas.” Caritas, in turn, use the money for a supermarket program giving rechargeable cards to Rome’s needy to help them get groceries. That’s absolutely awesome! Spanish Steps another tourist destination that is truly crowded. The elegant staircase consist of 135 steps over 12 different flight. It has an irregular albeit symmetric structure. It is said to be more beautiful during spring, when it is decorated with flowering azaleas. At the top of the steps, the Chiesa della Trinita dei Monti church. It is located in Piazza di Spagna, a name given to the place after the Spanish Embassy to the Holy See. St. Peter’s Basilica in Vatican City (an enclave in Rome) is truly an impressive building with a majestic dome probably the largest church in Christendom. The interior of the church is filled with many masterpieces of Renaissance and Baroque art, among the most famous of which is Michaelangelo’s PIETA. Expect a queue and strict dress codes, therefore shorts, miniskirts or bare shoulders are not allowed. This is just an overview of the St. Peter’s Basilica. I will have a separate article about Vatican City including St. Peter’s Square, Sistine Chapel, Vatican Museum and more of St. Peter’s church. If our favorite food is the basis of our nationality, therefore I am an Italian hahaha! Pasta and Pizza of all kinds is my favorite food and Italy is truly a haven for food lovers. They create the best pasta and pizza using fresh ingredients and herbs. There is more to see and experience in Rome. One of those places that I really wanted to explore more someday. No where else in the world you can witness so many architectural and iconic ancient ruins in one place. It’s like a piece of history from the past being brought back for us in modern time. The Eternal City is romantic, fashionable and a haven to sense the ancient Rome blending well with the modern life. It is true that only in Rome is it possible to understand Rome.